Improved healthcare services, especially for emergency treatments, have helped attract more foreign patients, including expatriates living and working in Vietnam, travellers and visitors. In a recent case, a patient from Australia who collapsed at Tan Son Nhat International Airport on March 30 in HCM City because of sudden heart attack after the flight was brought to the City International Hospital in HCM City’s Binh Tan District for emergency treatment. His symptoms included dizziness, excessive sweating, fatigue and low blood pressure. After an examination and laboratory tests, the results showed that he had a complete heart block, right bundle-branch block, and other health problems. Much of his heart had stopped responding properly to nerve impulses telling it to beat, and other parts of the heart were beating poorly. An immediate procedure was performed by Dr Nguyen Huu Tung, head of cardiology and vascular intervention at the hospital. Coronary angiography, a procedure that uses X-ray imaging to see the heart's blood vessels, revealed a dominant right coronary artery (RCA) with 80 per cent ostial stenosis, which is an abnormal narrowing of the blood vessels of the heart. A drug-eluting stent was successfully used in the ostial RCA lesion with an outstanding angiographic result. The patient also had a history of end-stage chronic renal disease, which is a factor underlying poor outcomes of percutaneous coronary interventional procedures and development of acute renal failure complications postoperatively. Because of these factors, he was prescribed dialysis. After several days of treatment, his heart rate and renal situation gradually improved, and, thus, he was able to avoid a permanent pacemaker implantation. He was discharged from the hospital seven days later. The patient felt satisfied about emergency treatment services at the hospital, and said he was impressed about the treatment. It was his first visit to Vietnam. “The hospital reviewed and solved the urgent issue and rescued him quickly,” the patient’s wife said. In another emergency case, the Vietnam-Germany Friendship Hospital provided treatment to a Taiwanese traveller in Hanoi. After he was discharged and returned to Taiwan, he donated US$100,000 to the hospital. “We want to promote Vietnam as a medical hub of Southeast Asia and Asia Pacific,” Lucas added. Last year, the hospital admitted nearly 16,000 foreigners and overseas Vietnamese, including 4,000 from Cambodia. The hospital, which has staff who can speak English, works with the city 115 Emergency Aid Centre to receive foreigners for emergency treatment. The hospital also works with domestic and foreign private health insurance companies, creating favourable conditions for payment. Minister of Health Nguyen Thi Kim Tien said the quality of healthcare services at many hospitals had improved and that prices are cheaper than in other countries. In the dialysis sector, for example, foreign tourists who need the treatment can access several hospitals with dialysis systems that meet global standards. Many expats living in the country trust the improved quality of healthcare services and have gone to hospitals for treatment instead of returning to their home country. Last year, hospitals provided healthcare services to more than 300,000 foreign patients, including 57,000 inpatients. This was an increase from 234,000 in 2014. Of these, there were more than 26,000 inpatients. 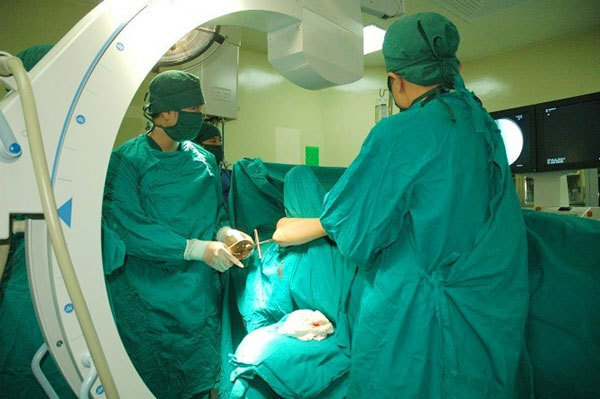 Services provided to foreigners included dentistry, vascular intervention, oncology and others. These figures reflect positive signals for the country’s health sector, Tien said at a meeting with the media held in January. The ministry will continue to improve service attitudes of health staff and upgrade facilities for hospitals, she said. “We are trying to attract more expats for health examinations and treatment and reduce the number of Vietnamese people going abroad for treatment,” Tien added. Several hospitals such as Cho Ray Hospital and HCM City University Medical Centre have many 5-star rooms and doctors with high expertise. The second facility at Bach Mai Hospital and Viet Nam-Germany Hospital is under construction with international standard designs. Tien has instructed many central-level hospitals to focus on developing more specialised healthcare services. More professional health centres are also being built in Hanoi, Hue City in Thua Thien Hue Province and HCM City to provide training in advanced technologies for doctors throughout the country.